Martin van Creveld: The Transformation of War: The Most Radical Reinterpretation of Armed Conflict Since Clausewitz , Free Press 1991. This was was pushed on me by Eirik Newth, on the theory that I would be interested. He was right. Van Creveld shows how the traditional, Clausewitzian concept of war (as a fairly regulated game between two clearly identifiable nations, a “continuation of politics by other means”) breaks down when the fight is not about land, but survival, and when the power differential between the two warring parties is too great, the nature of war will change towards terrorism and other forms of “low-intensity” conflicts, increasingly also targeting political or military leaders rather than their fortifications. Another very important reason why, over time, the strong and the weak will come to resemble each other, even to the point of changing places, is rooted in the different ethical circumstances under which they operate. Necessity knows no bounds; hence he who is weak can afford to go to the greatest lengths, resort to the most underhand means, and commit every kind of atrocity without compromizing his political support and, more important still, his moral principles. Conversely, almost anything the strong does or does not do is, in one sense, unnecessary and, therefore, cruel. For him, the only road to salvation is to win quickly in order to escape the worst consequences of his own cruelty; swift, ruthless brutality may well prove more merciful than prolonged restraint. A terrible end is better than endless terror and is certainly more effective. By way of an analogy, suppose a cat and mouse situation. Its very size precludes the mouse from tormenting the cat, though it is capable of driving him crazy–a different matter altogether. The cat, however, must kill the mouse at once. should it fail to do so, then its very size and strength will cause its actions to be perceived as unnecessary; hence–had it been human–as cruel. There are a number of other points as well – about the role of women in war, for instance: The smaller the group, the more directly active the women, but as soon as things become organized and regular, the women are relegated to support roles, so as not to spoil the game for the men. This book was written in 1991 and does, of course, not say much about the Iraq conflict, but it is, according to Wikipedia, required reading for US Army officers. It should be. On the negative side, the writing is uneven and a bit repetitive – I found myself longing for a table or some sort of timeline of wars, and fewer restatements of the main hypothesis. But in most places, it shines. This entry was posted in Reading on May 28, 2007 by Espen. Tyler Cowen, economist and blogger, has a list of his favorite things Norwegian over at Marginal Revolution. My comment: I find Undset boring (and overrated), and Hamsun can be quite a piece, too (Hunger is good, but read it before Dostoevsky’s "Crime and Punishment" or Sartre’s "Age of Reason" which explore similar themes, i.e., aimless walking around while thinking deeply existential and mostly depressing thoughts.) As for other authors, try Erik Fosnes Hansen‘s "Psalm at Journey’s End", something by Ingvar Ambjørnsen (the movie "Elling", nominated to an Oscar a few years ago, is based on his books and deserves mention in the film category). Or perhaps something by Jan Kjærstad? Tyler also notes the Norwegian Petroleum Fund, which is one of those things we Norwegians have a very ambivalent relationship with…. This entry was posted in Notes from a small country on May 25, 2007 by Espen. John Batelle has visited HP and used their Halo videoconferencing lab, which looks pretty impressive. The hard part in that studio is not getting big screens and seeing the people talk to you, but to set up the cameras so that everybody there can see everyone else in the eye, i.e., that if the guy to the far right of the screens in the picture is looking at the woman to the far left, it looks to him and her as if they are looking at each other. Video conferencing is one of those technologies that you wonder why never take off big-time, until you start using it yourself and begin to understand that the barriers to adoption are rather high. There are so many small details that you have to get used to, such as the fact that if the person you are talking to is not looking you in the eyes, that is not because he or she is shifty, but because they are responding to your picture. If you want to look honest and interested, you better learn to look into the camera rather than at the person you are talking to. Of course, then you can’t judge their facial expressions. Add latency, and you have a potential for very stilted and formal conversation until people get used to it. I learned to use videoconferencing from a master: Doug Neal, research fellow with CSC and one of the world’s experts on this technology. Back when I worked for CSC we hade videoconferencing equipment at home and did a lot of meetings, sometimes with as many as 10 destinations (with the screen split in 9 and your own picture disabled, this worked fine.) We even established a system of signalling for the floor by waving, which broke down when my 5 year old daughter came into my office, sat in my lap and waved to all the people on the screen. This entry was posted in CIO corner on May 18, 2007 by Espen. 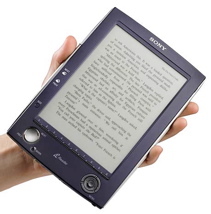 Kevin Kelly’s very useful blog Cool Tools has an entry about the Sony Portable Reader, which the reviewer thinks trumps the Iliad. I have been meaning to get one of these devices for a while – looks like it will be Sony, on the theory that it is better to get one device that does things well than one that does many things less well. Anyone with Iliad experience? This entry was posted in Reading on May 16, 2007 by Espen. Nicholas A. Basbanes (1995): A Gentle Madness: Bibliophiles, Bibliomanes, and the Eternal Passion for Books. This is the book to pick up if you feel guilty about having too many books: Basbanes tells of book collectors and their passion, describing the need to have many books and to keep them (and, occasionally, read them) as a psychological condition its sufferers have no need or desire to be cured of. If you ever have felt guilty (as I have) about those cases of books in the basement and the lack of visible wall surfaces in your home, this is the cure: Basbanes make it all seem so normal, almost desirable. How fitting that it is out of print – if you can get your hands on a copy, add it to you collection! This entry was posted in Reading on May 2, 2007 by Espen. Amartya Sen: The Argumentative Indian: Writings on Indian History, Culture and Identity (2006), Picador. I picked this up in India, after having read Gurcharan Das’ India Unbound and wanting to learn more about the history and society of a country that holds a fifth of the world’s population and now, finally, is beginning to pull its weight in the international economy. Sen’s collection of essays is the intellectual complement to Das’ rather easier and less multifaceted account of the economic liberation of India, focusing on the central aspects of deliberation ("argumentativeness") and religious tolerance that has been central to India for centuries. The book echoes my own impression of India: That it is a mosaic rather than a melting pot, and a mosaic that seems to be able to sort things out in a peaceful, democratic and intellectual manner. Notwithstanding certain dynastic tendencies (not unlike the USA, incidentally), India has always been a heterogenous society, tolerant of religious variety, open to ideas, with lively debates and a relative lack of coercion. Any collection of essays, primarily built on speeches, runs the risk of repetitiveness and a certain heaviness of language, and this collection is no exception. I particularly like the chapter on Tagore and his role in the building of India (for some reason he is seen as a sometime-fashionable mystic by Western readers, at least as I dimly remember from my high-school days), as well as the discussions of India’s argumentative tradition throughout the centuries – democracy did not come to India with the English, who rather built on a tradition of debate and openness that was already there. Sen cautions against an idea of India as a monocultural country in general, and as a militant Hindu contry in particular: India has 180 million Muslims, for instance, living peacefully among many other religions. This entry was posted in Reading on May 1, 2007 by Espen.